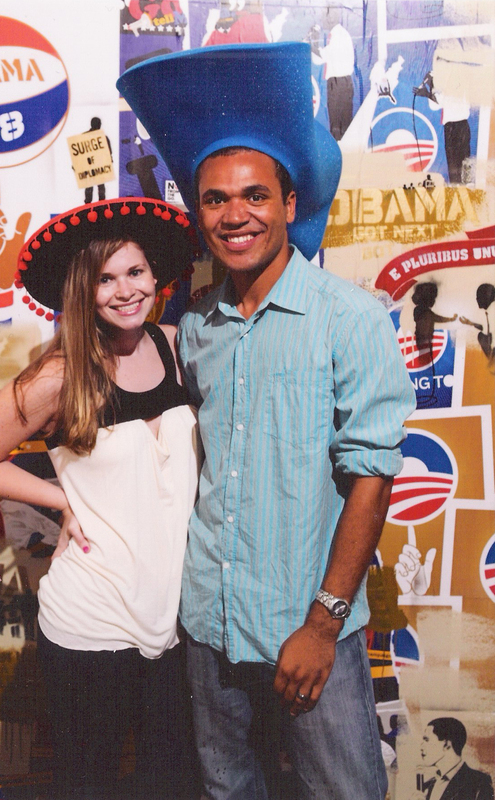 This past Thursday, Alex, our friend Kevin, and I went to an art exhibition inspired by Barack Obama! It was in one of my favorite areas of Austin in the warehouse district on 2nd and Colorado. We had heard about the event when chatting with store owners of IF + D (one of our fav Austin furniture stores) and decided to make it a point to go. The event was a lot of fun, as you can see by the picture of Alex and me with awesome hats (there was a treasure chest with costume accessories). Guests were able to snack on hor’dourves, sip wine and imported beers, and listen to the DJ’s creative mixes. We bought one of the many posters that were being screen printed in front of the gallery and IF + D and can’t wait to frame it! Entry filed under: Political. Tags: Barack Obama art exhibition. Exciting house update	How did I get on THIS mailing list? Those chairs were pimp. Let’s all split one and share it. 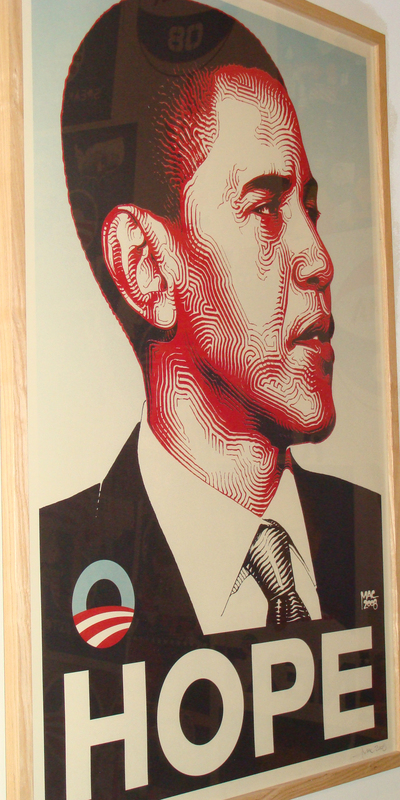 I love all the screen print posters that have been popping up with Obama. I was headed to the Obama headquarters today to pick one up. You’re the cutest mariachi I have ever seen. And I bet that over-sized novelty hat fit Town like a glove… a head glove. atown: that oversized novelty hat DID fit town like a glove…..a tight glove. Both my brother and my brother from another mother are afflicted with GDS: Giant Dome Syndrome. Won’t you please help? But seriously, if Town knows of a specific sunglasses company that makes specs to fit generously sized craniums, please let me know. My brother is dying for a pair of sunglasses. The tiny suns orbiting his head are really starting to take their toll on his retinas. HAHAHA poor ansley doesn’t have any sunglasses? town always gets his from Kohls or Marshalls (ya know the cheap places) and never seems to have problems.